Last week a couple of network analysis tools landed in my inbox and after having a quick play I thought they were worth highlighting here. In this post I’m going to have a quick look at SocialBro which is billed as a tool to ‘manage and analyse your Twitter Community. Browse your Community Search your followers and friends using different criteria such as name, location and description. Filter and Sort Number of followers, followers/friends ratio, frequency of tweets, account age, recent activity, language, time zone. 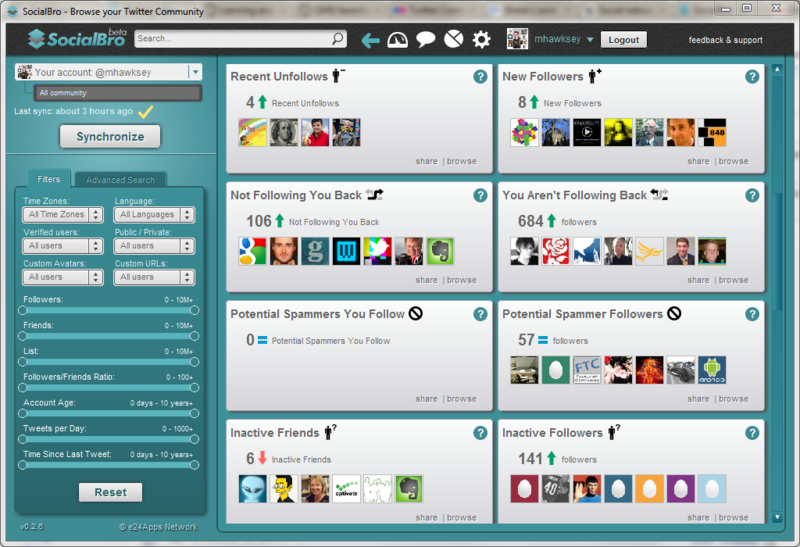 Easy Unfollow Tools Detect noisy friends, potential spammers, inactive friends and easily unfollow them. Track Unfollows Detect who recently unfollowed you and you can easily unfollow them back. 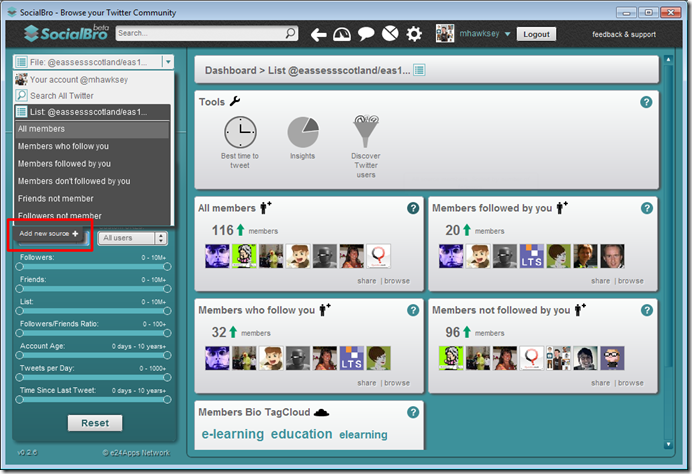 Manage Twitter Lists Organize your followers and friends by creating Twitter lists with the search results. Backup your Twitter Community Download all your Twitter followers and friends to a local database which you can consult even when offline. Fast Communication Tweet and direct message from search results. 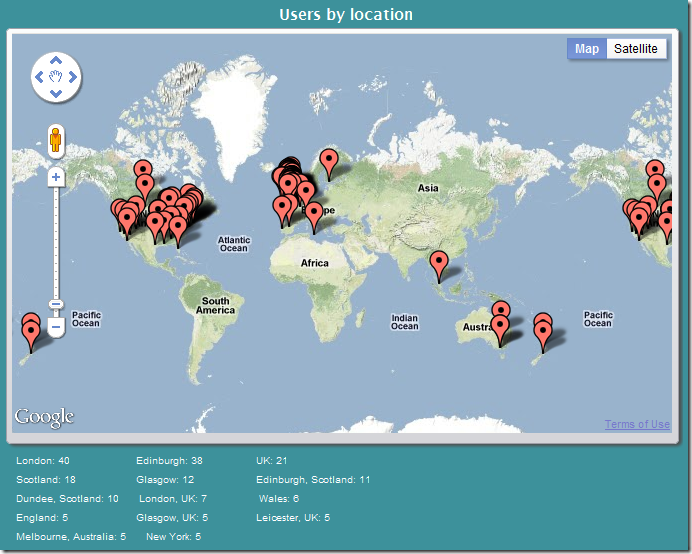 Visualize Statistical Information Time zone charts, languages charts, users by number of followers, users by recent activity, etc. 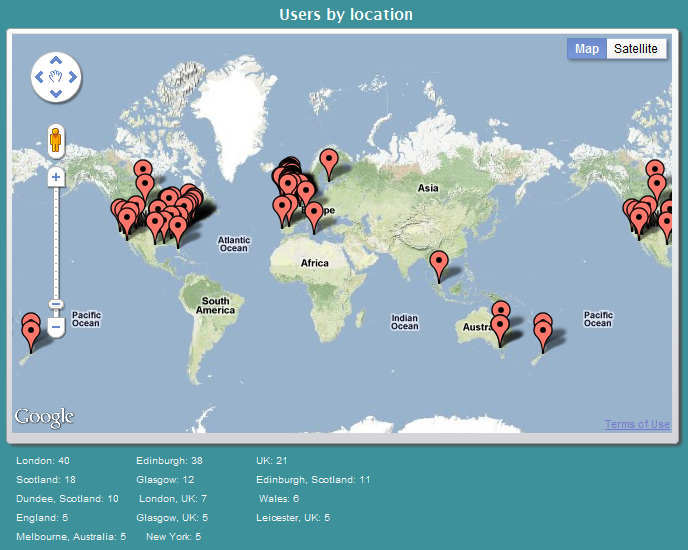 See your Community in Map Visualize the world wide distribution of your community in a map. 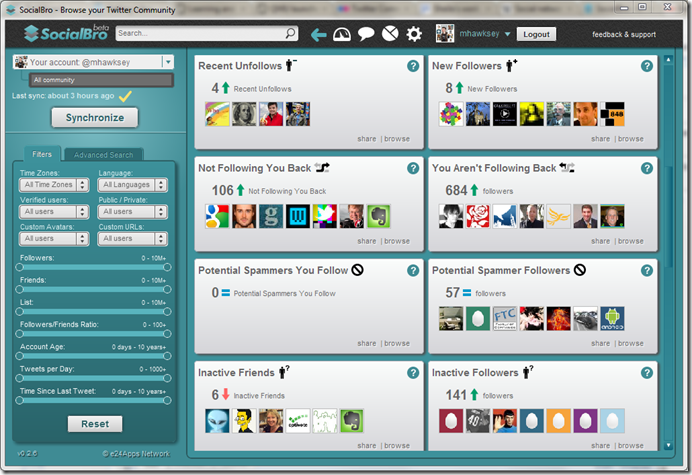 You’ll find a number of these features in other web services, for example, I already use TwUnfollow.com to see who unfollows me. The big difference with SocialBro is it’s the first downloadable Twitter analytics tool I’ve seen (I’m ignoring the Archivist Desktop because while its great at downloading search terms it doesn’t have much in the way of analysis). The client uses Adobe Air which gives it cross-platform support (if you are using TweetDeck Desktop you already have Air installed). Once the software is installed you need a beta account with SocialBro, which for me was processed very quickly. I noticed that each time you start the software it checks that you have an account with them. You can cancel this and still access your locally stored data but you can’t synchronise. I’m guessing once they get out of beta there’ll be a freeium or even just a premium model. 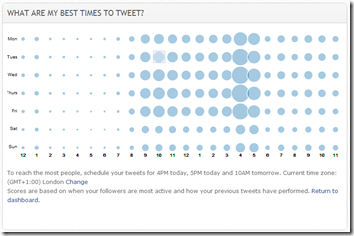 As well as being able to export your friends and followers as a csv file there are a couple of build-in reports for ‘Best time to tweet’ and ‘Insights’. 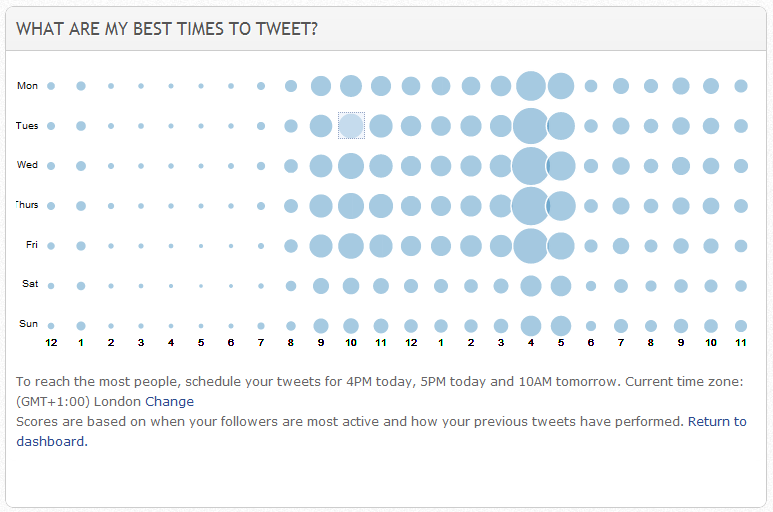 Here’s my full ‘best time to tweet’ report from SocialBro. Something I’m not sure about is “the free version of “Best Time to Tweet” is generated by analyzing only your top 100 followers”. I’m not sure how they are categorising ‘top’ but I’m guessing they mean ‘last’. It’s interesting to note that SocialBro and online Twitter analytics service Crowdbooster have very similar best time to tweet matrix charts. As well as SocialBro giving you a overview and option to filter things like non-reciprocal relationships for your account you can also add additional data sources. These sources can be Twitter searches, other Twitter user’s friends/followers or Twitter lists. For example, I added the eas11-delegate list and I can see that of the 116 members I only follow 20 so their might be some interesting people to checkout in the remaining 96.